See all 108 items in product family Battery Powered Lift Stackers Handle Skids, Bales and other Commercial or Industrial Products or Material Loading Applications. Battery Powered Lift Stackers are solidly manufactured for long lasting durability and dependability. Various brands offer wide selection of Adjustable Fork or Platform type stackers to meet particular load lifting need or application. Include 12V battery powered hydraulic lifts and easy access rear affixed or remote control systems. Sturdy bars or push handles and rugged wheels or rollers provide easy mobility and maneuverability. Available in 1000 to 2200 lb. load capacities and 1-1/2 to 5-3/4 inch lowered and 52 to 150 inch raised fork/platform height capabilities. See all 3 items in product family Vestil Lift Stacker can be used as a Manual Hand Pump Lift or an Electric Powered Lift. These stackers are economical lift trucks ideal for maintenance and commercial applications, including transporting dies, molds and skids. 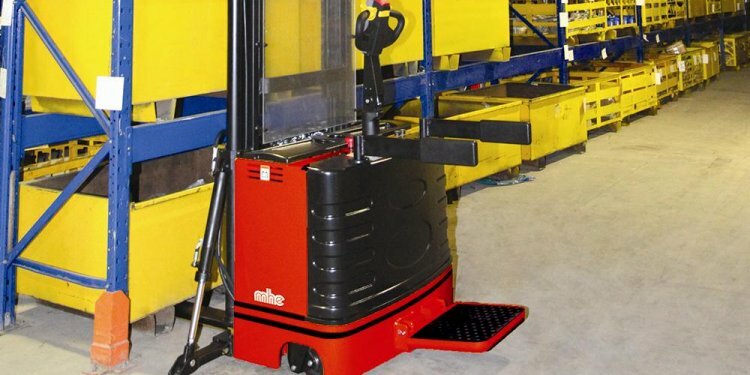 Battery powered DC lift stacker also has a manually operated pallet truck design Hand Pump lift that's ideal for use where power is not available for additional flexibility. Compact design features a durable steel frame and a proven high-quality hydraulic pump / 1.5KW DC electric motor lift system. Lift truck includes (2) 12V 40Ah batteries, 10 amp integral battery charger, battery level gauge and adjustable lowering speed. Rolls smoothly on 2 rigid nylon load rollers and 2 swivel nylon steer wheels with brakes featuring foot guards to protect the operator. See all 5 items in product family Rugged Electric Lift is used for Congested & Compact Work Areas. AC Powered Electric Lift Trucks are perfect for all types of lifting of positioning tasks, and are built to withstand the daily rigors of lifting heavy loads. Electric Stacker features a 1 HP, 115V 1-phase 60 Hz AC powered motor for energy efficiency. Industrial grade leaf-type lifting chains have an 8250 lb. yield point for long life. Lift truck features fixed outrigger legs and 30"L x 3"W x 1" thick adjustable solid steel forks with 12"H fork backs and an 18" load center. Standard features include a heavy-duty floor lock for stationary positioning, a 10' power cord and a remote control with a 4' retracted / 20' extended coiled cord. See all 23 items in product family These Straddle Stackers Offer 5th-Wheel Steering For Easy Handling In Narrow Aisles. Electric stackers, with a 24" load center, are designed for rugged use. Electric pallet stackers do not require special training to operate; needs minimum maintenance under rugged and constant use. Lift trucks are designed for high performance using a heavy duty hydraulic system and a large deep cycle 12V battery with built-in fully automatic battery charger. Fork lift trucks include four 5" phenolic load wheels and an 8" high-impact fifth-wheel with a spring-loaded handle for easy maneuverability. See all 24 items in product family Work Positioner Battery Powered Lift Stackers Are Used For Providing Increased Maneuverability In Commercial, Industrial Or Agricultural Product Or Material Loading Applications. See all 6 items in product family Versatile Lift is Used for Feeding Pallet Racks or Pallet Carousels. These battery powered lifts allow you to perform multiple functions with one machine. They can be used independently as a pallet positioner or in tandem with a skid turntable positioner to remove loads quickly and easily. Rugged steel stackers feature a 1.1 KW hydraulic lift motor, 12V / 75AH AGM (Absorbed Glass Mat) sealed battery, integral 12 amp automatic battery charger and battery gauge. Lift truck includes a push-button lift control, hand operated brake for stationary positioning, and an ergonomic handle with chain-assisted steering for easy turning. Rolls easily on 7" polyurethane steer wheels and 3.3" polyurethane load wheels with protective safety foot guards. 24" load center. 2 Year Limited Warranty. Forks Over Fixed Legs lift trucks are used for use with skids and feature 45"L x 6-½"W forks. Adjustable Forks Inside Fixed Straddle Legs lift stackers are for use with pallets and have 42"L x 4"W forks.